Anyone else get this email this morning? What a shocker! 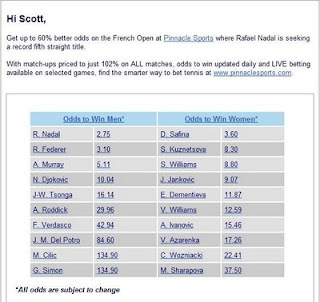 Nadal at 2.75 to win the French Open? Pig's arse! If they were in the UK they'd cop a severe blast for false advetising and deservedly so. Someone should be sacked for a massive balls-up like that. The men's prices are obviously for Wimbledon. Have been hearing weird things about behind-the-scenes issues at Pinnacle of late. Not the sort of things you want to hear about a book which has had a very high reputation for several years.